El Angel de la Independencia al atardecer / The Angel of Independence at dusk and in the background the Torre Mayor [building]. 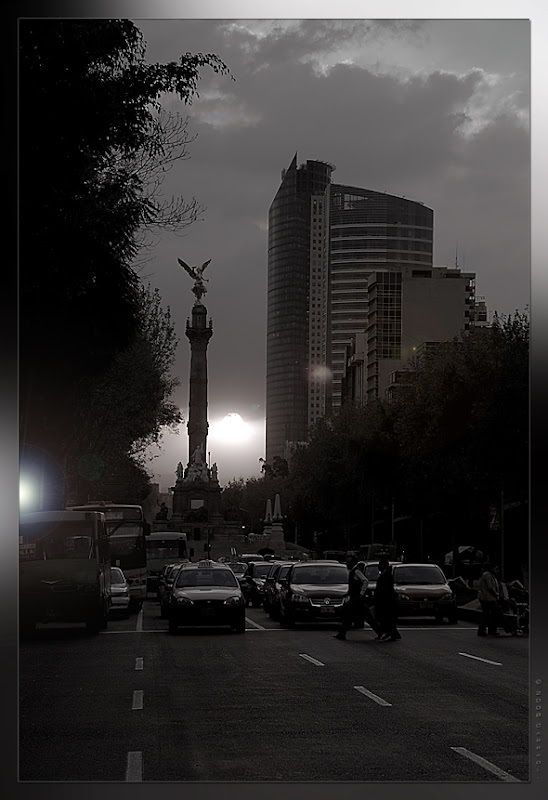 El Ángel de la Independencia ("The Angel of Independence"), most commonly known by the shortened name El Ángel and officially known as Columna de la Independencia, is a victory column located on a roundabout over Paseo de la Reforma in downtown Mexico City. Very dramatic lighting - really makes this photo sing! Wow, this really busy downtown. If you not mentioned about statue of The Angel of Independence, I might just looked at the people and cars. Very interesting shot. Thanks for looking my blog. Chuck, Iblowfish, thanks a lot for your comments.